Wanaka is surrounded by rolling alpine farmland, but most of it is privately owned and inaccessible. This half-day tour opens the gate to one of those farms, the massive West Wanaka Station. 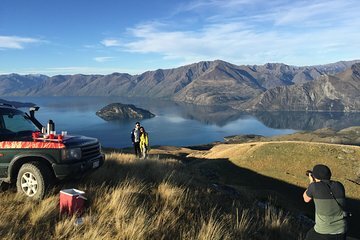 Explore the Otago back-country in a private four wheel drive vehicle, stopping for astonishing photo opportunities against the backdrop of Lake Wanaka, the Southern Alps and Mount Aspiring National Park.